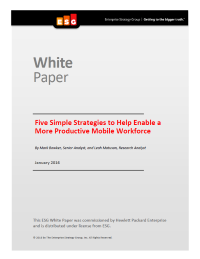 It is no shock that in today’s highly engaged world, IT must embrace the needs of both the business and an ever present mobile workforce. Embracing the modern infrastructure, optimizing the management of IT systems, promoting automation, and empowering a mobile workforce are all part of a holistic strategy that enables IT to improve IT control and security. Download this report to learn more.